Events | Breaking Away, Inc. 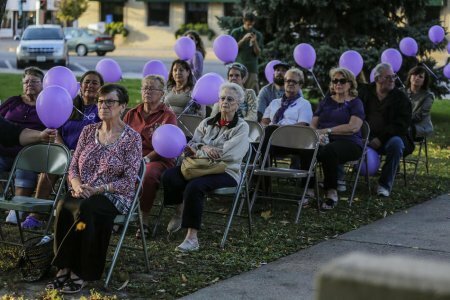 Annually, Grundy County hosts a "Take Back the Night Event" in October during domestic violence awareness month. The purpose of the event is to spread awareness and education about domestic violence, a problem that will affect 1 in 4 women, and one in 7 men in their lifetime. This is a community issue and every community is affected by it. 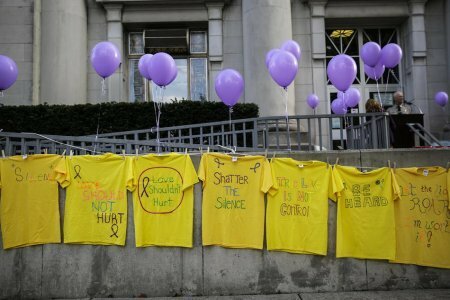 "Take Back the Night" attempts to reduce domestic violence by educating the public. Victims are also offered strength and support from attendees who want to help them break the cycle of violence. Past guest speakers have included well-known author and local domestic violence survivor Shirley Kiss who wrote about her life experiences and the impact that abusive relationship had on her book "In Spite Of". This year's event will be in October 2017. Hello, my name is Jason Helland and I am the Grundy County State's Attorney. I would like to thank you for coming out to our annual take back the night program. 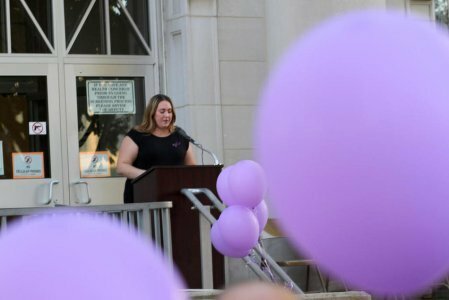 Take Back the Night coincides with October's Domestic Violence Awareness month. The purpose of this event is to spread awareness and education about domestic violence, a problem that will affect 1 in 4 women and 1 in 7 men in their lifetime. Nearly 3 out of 4 of Americans personally know someone who has been a victim of domestic violence. Too many women have been held captive to domestic violence, whether through physical abuse, financial abuse, emotional abuse or a combination of the tree. Domestic violence not only has an impact on the people living in the home where the abuse is taking place buy often has an impact on the streets, in school, and the workplace. There is little doubt that people abused as children often become abuser later in life. The number of American troops killed in the Middle East between 2001 and 2012 was nearly 6,500. However, during the same time period, the number of American women who were murdered by a domestic partner was over 11,700. That is nearly double the number of casualties lost during war. Domestic violence touches the lives of Americans of all ages, leaving a devastating impact on women, men, and children of every background and circumstance. A family's home becomes a place of fear, hopelessness, and desperation when a woman is battered by her partner, a child witnesses the abuse of a loved one or a senior is victimized by family members. The State of Illinois has strengthened its response to this crime and has increased services to victims. Still, far too many women and families in the county and state are affected by domestic violence. During October, we recommit ourselves to ending violence within our homes, our communities, and our country. To effectively respond to domestic violence, we must provide assistance and support that meets the immediate needs of victims. Facing social isolation, victims can find it difficult to protect themselves and their children. They require safe shelter and housing, medical care, access to justice, and economic opportunity. In the best of economic times, victims worry about finding a job and housing and providing for their children; these problems only intensify during periods of financial stress. Victims of violence often suffer in silence, not knowing where to turn, with little or no guidance and support. Sadly, this tragedy does not just affect adults. Even when children are not directly injured by violence, exposure to violence in the home can contribute to significant behavioral, social, and emotional problems. An estimated 10 million children are exposed to domestic violence each year. High school students who report having experienced physical violence in a dating relationship are more likely to use drugs and alcohol, are at greater risk of suicide, and may carry patterns of abuse into future relationships. Our efforts to address domestic violence must include these young victims. During this month, we rededicate ourselves to breaking the cycle of violence. By providing young people with education about healthy relationships, and by changing attitudes that support victims, we recognize that domestic violence can be prevented. We urge community leaders to raise awareness and bring attention to this crisis. Thank you, Sarah, for helping us put on the event tonight. Educating the public about domestic violence is a tough sell. Rather than treating domestic violence as the crime that it is, there are still some who see the abuse as a family matter--and it's just better for everyone if we don't pry. Then there's also the stigma that attaches. The Illinois General Assembly is constantly studying the situation and attempting to improve our laws as they affect domestic violence victims. While I was preparing for this speech tonight, I researched new Illinois domestic violence laws. In the last year, the Illinois Legislature passed Public Act 99-766. What is this law? This law requires an hour of training in domestic violence and sexual assault for nail technicians, hairdressers, and cosmetologists who must renew their licenses every 2 years. This training attempts to educate the workers on how to spot signs of abuse. The Illinois legislature has turned to the beauty profession to help spot ugly situations at home. Har salon employees across Illinois have become the new front line in identifying victims of domestic and sexual violence and educating them about their options when they are confronted with these issues. The legislators identified that victims of domestic violence are more likely to confide in salon employees than a law enforcement or medical professional. Many witnesses also testified that perpetrators of domestic violence exert so much control over their victims that the only time victims may be left on their own is to get their hair cut or their nails done. The law also states that salon employees can not be held criminally or civilly liable for acting in good faith or failing to act on information obtained during the course of employment concerning domestic violence or sexual assault. During committee hearings in Springfield, the founder of "Chicago Says No More" testified that victims on average only seek help after 35 incidents of abuse. She said that of the estimated 900,000 college students in Illinois, about 127,000 have been sexually assaulted, but only 5% will report the assault. Victims are reluctant to report their abusers for many reasons, including the potential loss of financial support, further attacks if abuse is reported, and the disruption of their family lives. It is easy to say that someone who is the victim of abuse ought to move out but where to? Families aren't always willing to take them in. Giving up the place you call home is never easy. Children, especially if they teenagers, may not want to leave.